Can Product Managers Work From Home? Ever since Marissa Ann Mayer put a full stop to the work from home option for employees at Yahoo!, not a day has passed without a few blogs or articles expressing their view point. Chiming in with the season, this post takes a look at work from home for product managers. The short answer it seems is: “it depends”. There are two primary parameters on which the decision hinges: Stage of the product and Team dynamics. 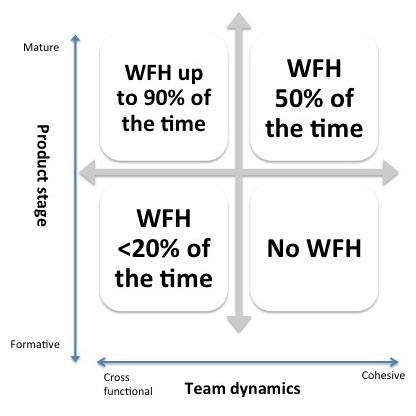 Product in formative stage: In a startup or a large enterprise, if the product is in its formative stage, then the team has a set of leap of faith assumptions and a set of hypothesis associated with the assumptions. Experiments to test the hypothesis has to be rapid and constructive. This requires all hands on the deck every single working day, if not on holidays. On the other end of the continuum is a cross-functional team working on a product in its early stage. In such a situation, the product manager can opt to work from home, albiet occasionally, without any productivity loss as such a structure usually has well-defined processes. Product in mature stage: A mature product with a cohesive team, is close to an ideal one. One could call this as something that has retained the soul of a startup. A product manager can, perhaps, opt for a 50% work from home in such situations; ideally unless there is a pressing personal need, a product manager should try to make it to work daily in this case. A mature product with a cross-functional team (across geographies as well?) is the best case for almost full-time work from home; it might most often be more productive than working from one’s cubicle. So, the concluding answer is still: “it depends”. This entry was posted in Product Management and tagged product management, wfh, work from home on April 15, 2013 by Vivek Vijayan.